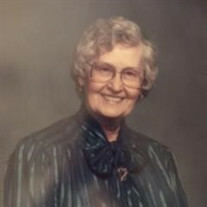 Lucille E. (Boone) Wendt, 101, of Hannibal passed away peacefully Saturday morning, October 8, 2016, at Beth Haven Nursing Home. Visitation will be from 12:00 to 2:00 pm on Friday October 14, 2016, at Smith Funeral Home & Chapel in Hannibal. Funeral services will immediately follow at 2:00 pm with Pastor Samuel Phillips officiating. Burial will be at Grand View Burial Park. Lucille was born March 19, 1915, in Montgomery County, MO, the daughter of Alfred O. and Maud Price (Tate) Boone. In 1936 she was joined in marriage to Maurice E. Wendt, co-founder of Wendt-Sonis Co. in Hannibal. Lucille was a loving mother, homemaker, and seamstress. She enjoyed fishing, gardening, walking, crocheting, doing jigsaw puzzles, and volunteering as a Gray Lady in the hospitals. K. Myrina Grober (Doug) of Berkeley Heights, NJ, Amy McIntyre (Stewart) of Hannibal, Kristyn Craigmiles of Overland Park, KS, Laura Craigmiles of Dallas, TX, and Amanda Wendt of Heidelberg, Germany. There are eight great-grandchildren, one great-great-grandson, and many nieces and nephews. Also surviving is a sister Susan (Boone) Higgins of St. Joseph, MO. Lucille was preceded in death by her parents; Maurice E. Wendt; brothers Charley Burton Boone, Harvey Lee Boone, George Edwin Boone; and sisters Katie (Boone) Klein and Clara (Boone) Honaker. Lucille was a long-time, faithful member of Tabernacle of Praise Assembly of God Church. Memorial contributions may be made to HLGU Craigmiles School of Nursing or to the charity of your choice, in care of the Smith Funeral Home & Chapel.